How much wood does my outdoor wood boiler use? Make a guess and you’ll have a chance to win. I cut up a medium-sized tree. I started burning it on a Sunday afternoon. The weather was blustery and in the 30’s. We kept the house at 75F, and the door to the uninsulated porch open most of the time. I’ll show a few pictures of the cutting process, and you’ll get a feel for the size of the tree. 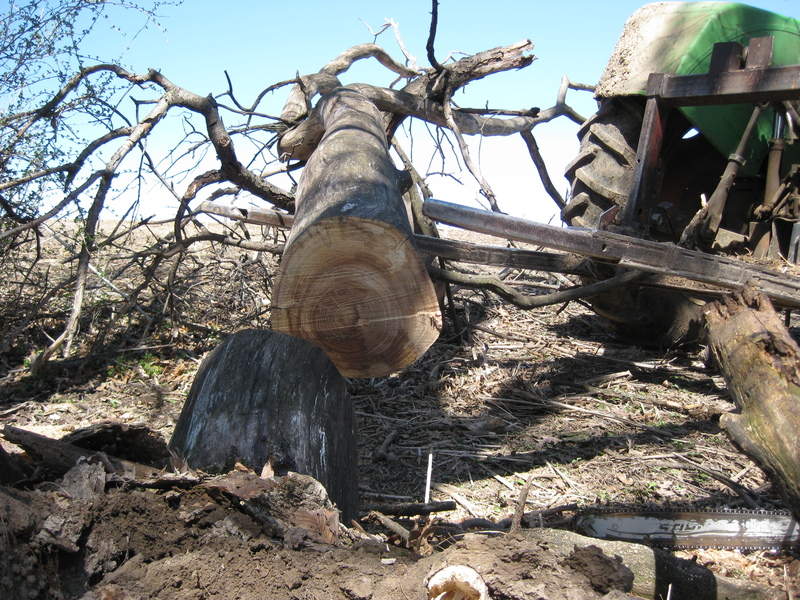 This elm tree died and fell over into a field, so it needed to be cut up before planting. 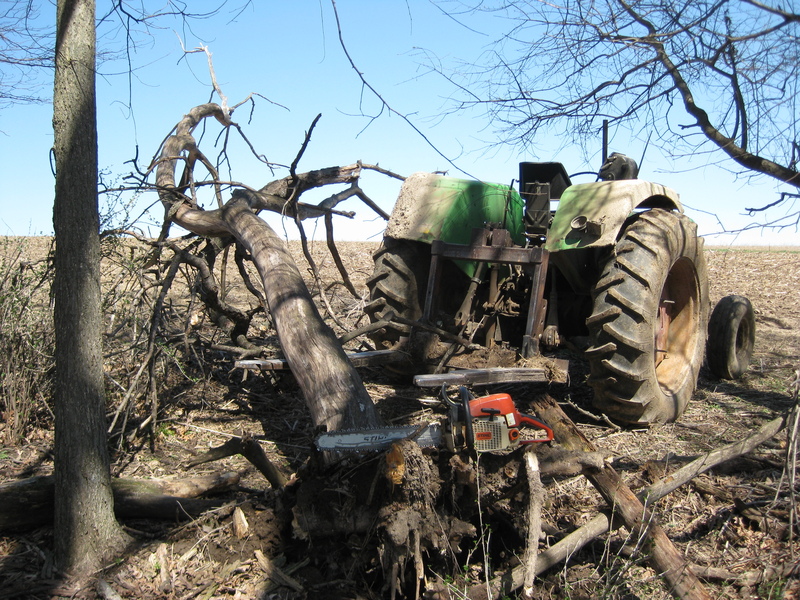 I used the bale carrier on the tractor to apply upward pressure so my chainsaw wouldn’t be pinched as I cut down through the trunk, separating the tree from the roots. I pulled the tree by the wood boiler. Shepherd held goggles over his eyes as I cut it up. 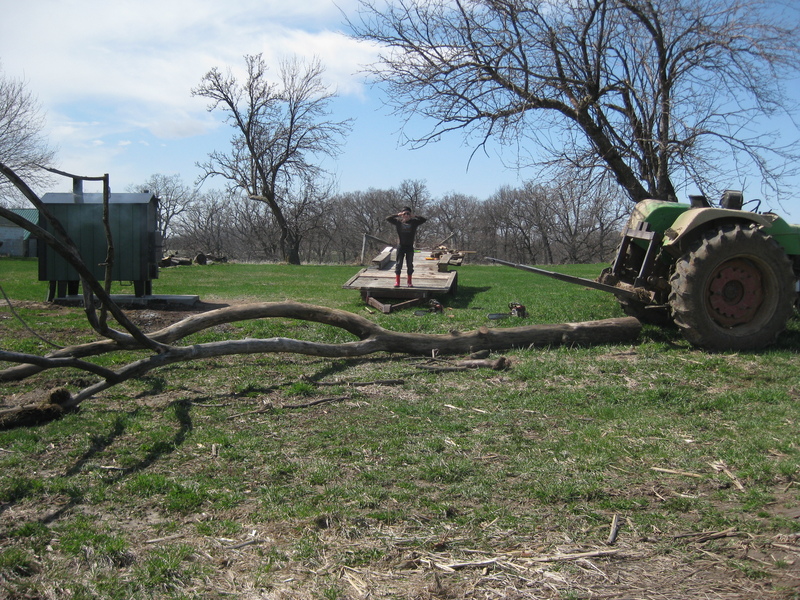 I use the bale carrier to lift the tree off the ground to make it easier to cut. How long do you think this tree lasted? Make your guess in days, and put it in the comments. Closest one wins a $25 gift certificate to Kiva. One entry per person. No duplicate days, first one with the right number wins. Good luck! 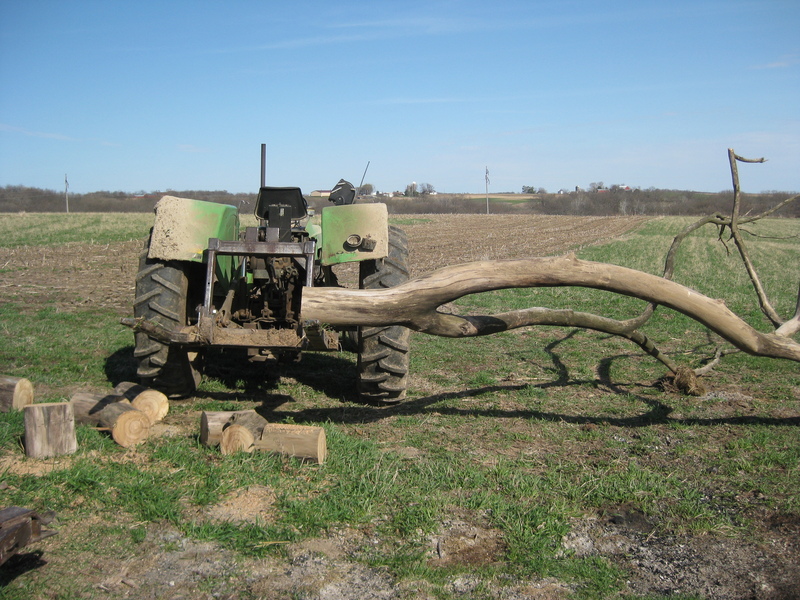 This entry was posted on Monday, April 25th, 2011 at 11:10 am and is filed under Curious farmer. You can follow any responses to this entry through the RSS 2.0 feed. You can leave a response, or trackback from your own site. 12 Responses to How Much Wood? I am guessing it was burned up in 5 days. My guess is between 4 and 15 days. Four days or so, if the wood was still uncured. Closer to 15 days if the wood was dry/cured. This is assuming you got 14 hours between re-stoking. So, final guess = 10 days. Happy to see all the comments. No correct answer yet. Nine days, two hours and seventeen minutes. I’m envious – I moved into a house with a wood burner a few months ago and I love it, but I have to buy wood, having no supply on the property. A bag containing perhaps as much wood as one of the pieces pieces shown behind the tractor in the last photo costs the equivalent of US $5 (although it is cut to size for me). Frankly I would quite enjoy chopping wood if I could find a “bulk” supply, but I live in the suburbs. Well, temperatures are alot warmer now, so I be this tree lasted about two weeks. What I want to know is how many cords of wood did you use all winter with your boiler? Well, I didn’t read the directions right…I thought we were supposed to guess the wt. of the wood. chuckle. Or was it the age of the tree. I was mesmerized by the pictures previously of your wood burner. That whole tree?? I would hope it would last at least 11 days…that’s a lot of wood to burn up. Can’t you ‘cheat’ a little and use heated mattress pads? Brrrr…It must be cold there still. It’s 50 degrees at 4 a.m. Sunnyvale, CA, 1 hr. south of San FRancisco. Sometimes, I think that’s chilly. BTW, our grass fed organic beef here runs about 6 bucks a pound. That was last year. I don’t know what it is this year. Thought you’d be interested to know. I just ordered my mum some and she lives in Illinois. It was half that amount/pound. Chainey, I like your precise estimate. Sean, I would like to know how many cords as well. Maybe I’ll keep better track next winter. I was just trying to get through this winter. Karen, Thanks for the interesting info on the grass-fed beef. No one is correct, yet. Here are the days which haven’t been picked: 1,2,4,7,8,12,13,15-38,40+. had every solution for our heating needs.